A while back, I was perusing the supermarket looking for potential ingredients that could be used in creams, lotions & potions (forget putting food in ones belly, there are far more interesting things to be doing in the kitchen). Anyway, I came upon the herbs and spices and, when one is in the mindset that I was that day, you don't see flavours. You see colours, textures, aromas, functionality, brief glimpses of finished products and the effects that could be achieved from them. What really caught my eye this day was the ground cardomon. So fine, so delicate, soooo aromatic and certainly not a spice that I keep in my cupboard (I'm not an adventurous or creative cook). I bought it and took it home. Cardomon is not the cheapest of essential oils but the aroma is just lovely and few people dislike it. The ground spice is equally as lovely, being warm, spicy-sweet & balsamic and, like the essential oil, its aroma strength is very good and certainly a much cheaper alternative. The powder of the ground cardomon is super-fine and got me thinking about its potential for gentle exfoliation and facial skin refinement. I tried it in a cleansing cream wash that I made previously, adding about a heaped teaspoon to roughly 50g of cream and worked this into my face for about a minute (using gentle pressure and working in small circles) and the result was truly outstanding. My skin felt fresh, clean and so very, very smooth. No stinging, no irritation. What's more, the aroma was wonderful and seemed to last an age - just lovely. Now, I just use it a couple of times a week, mixing a small amount into my usual measure of cleanser. I've not tried it in soap (yet) although I did use ground cinnamon, clove and sugar M&P soap. Here, I used the cinnamon and a dash of tumeric for colour (which was just lovely) and it gave the soap a multi-grade exfoliant texture - a good compliment to to the courser grade of the sugar. The aroma of the cinnamon was fairly good although I did boost it with some essential oil. 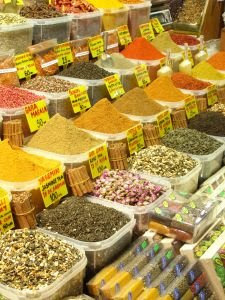 We have had a number of discussion on the Melting Pot Cafe Forum at Fresholi about herbs/spices in products. I would love to hear your experiences in soaps, products and infusions. That sounds like a highly successful spicy experiment! I bet the cleanser smells amazing with the Cardomon! Ooh Sue... It smells just lovely, ahh... But the exfoliant properties is truly excellent and leaves the skin so silky smooth.